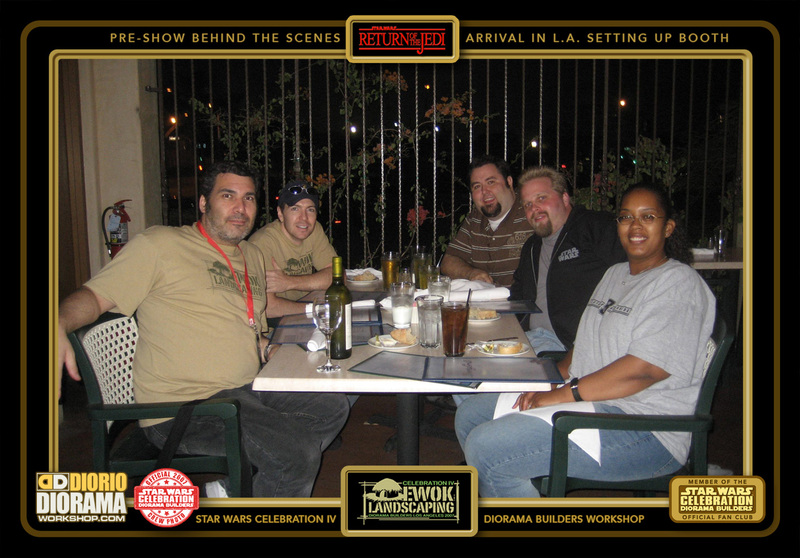 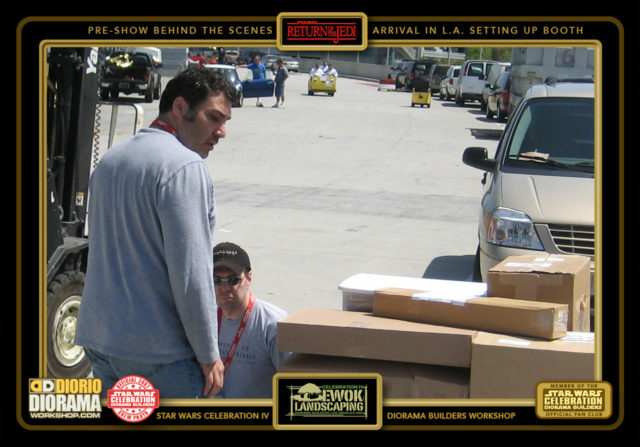 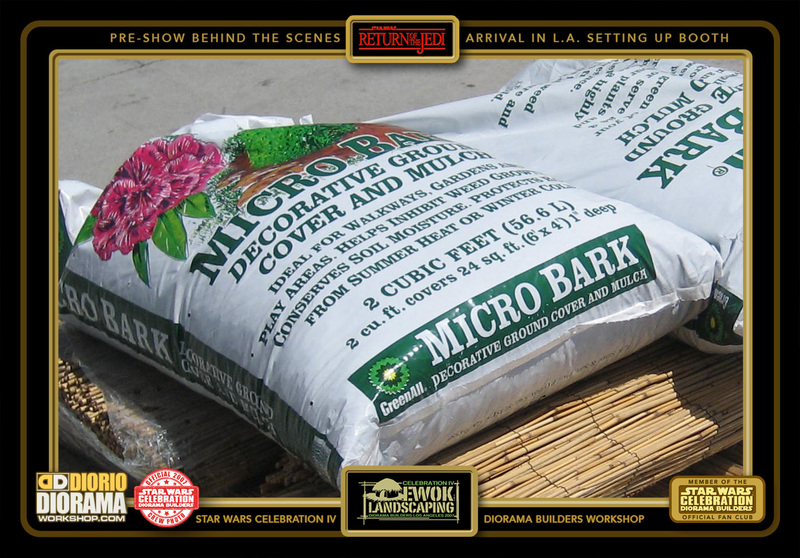 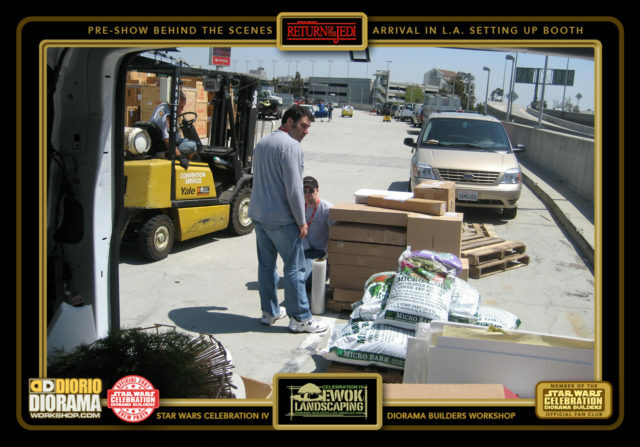 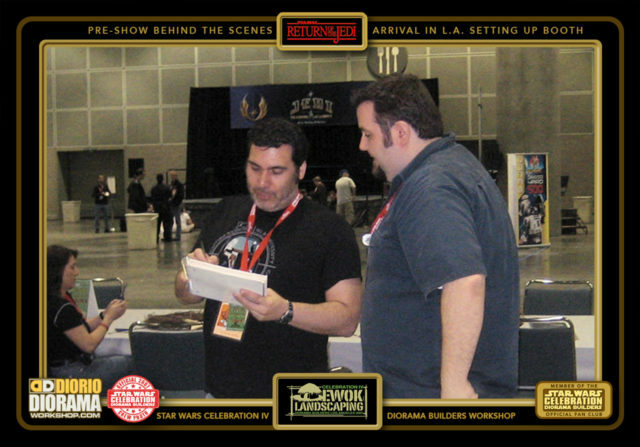 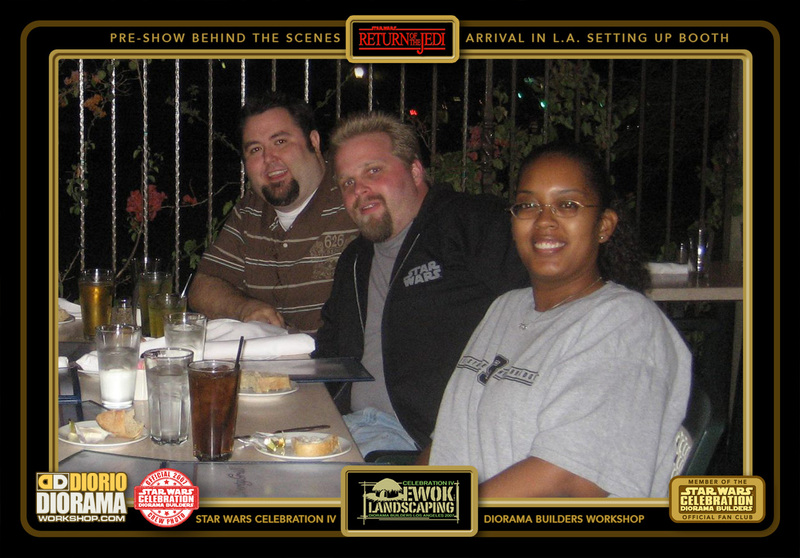 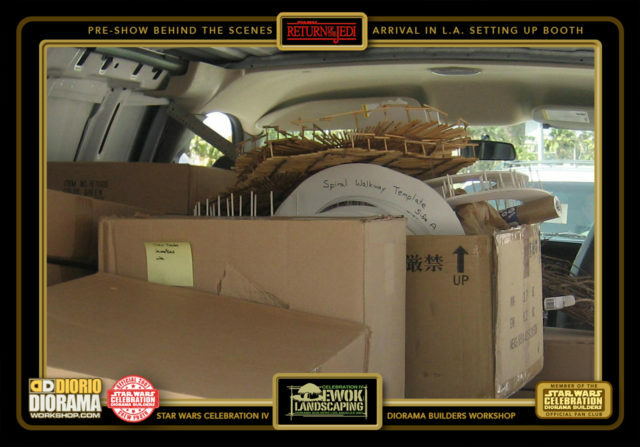 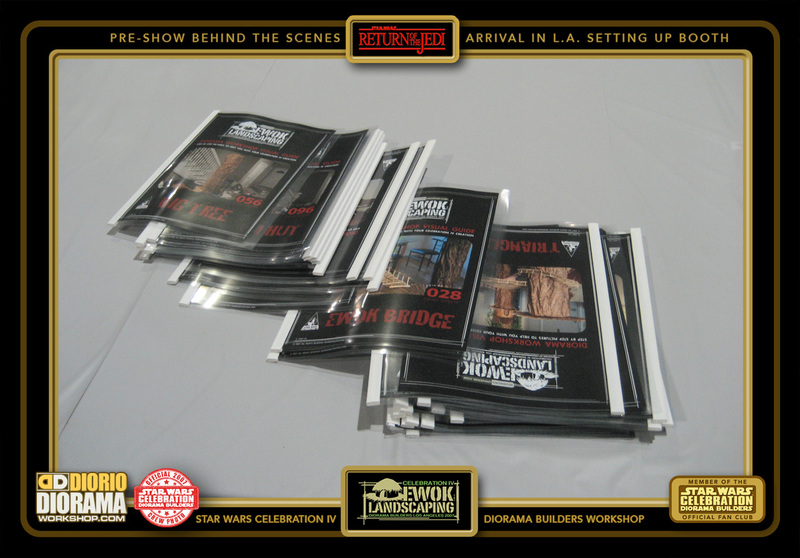 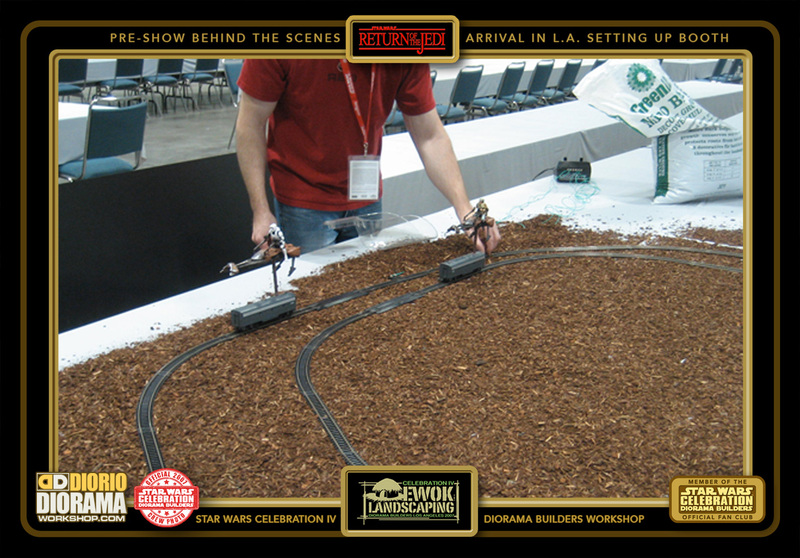 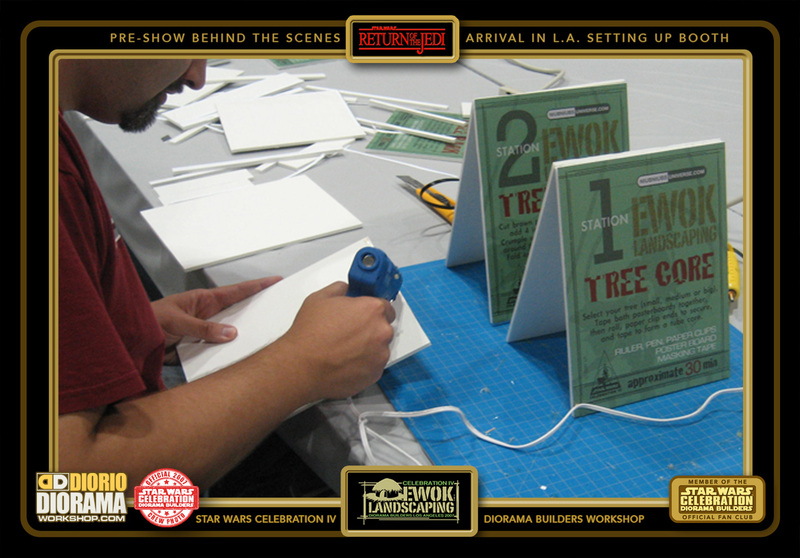 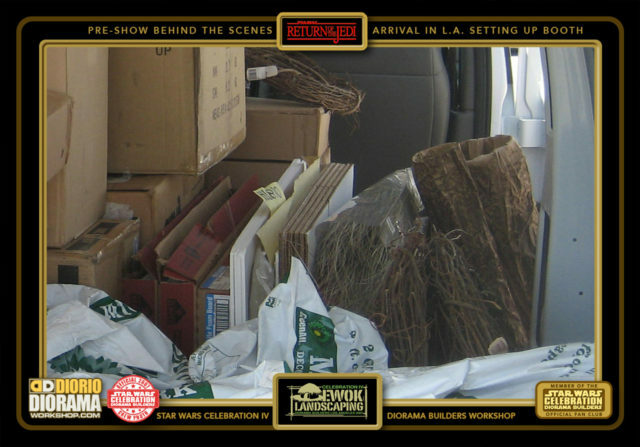 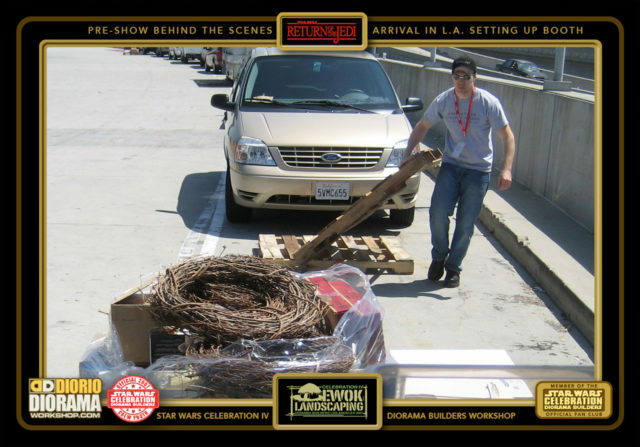 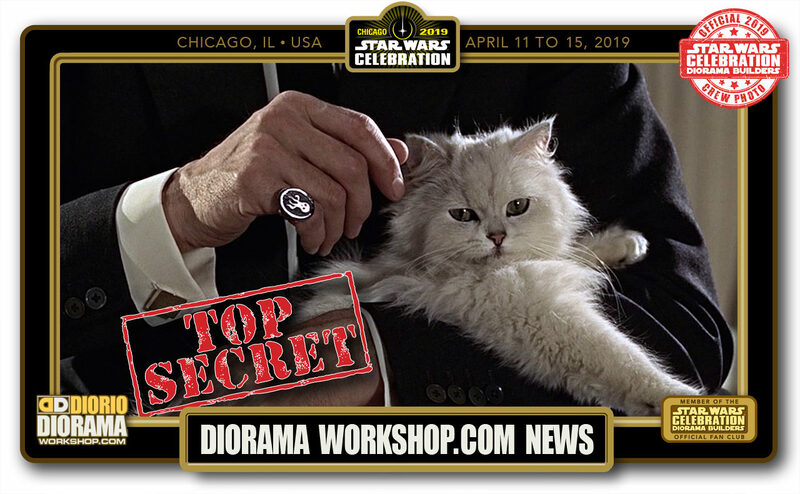 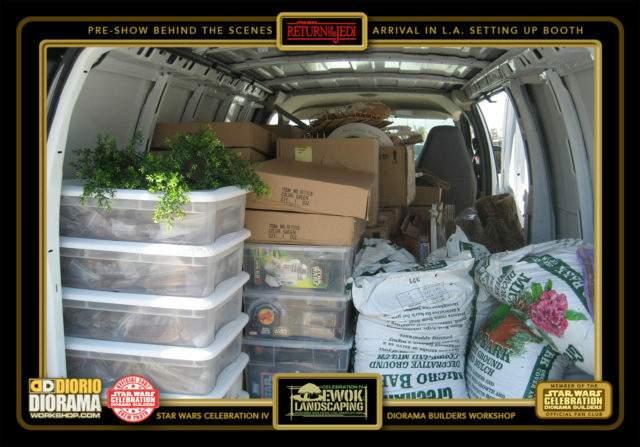 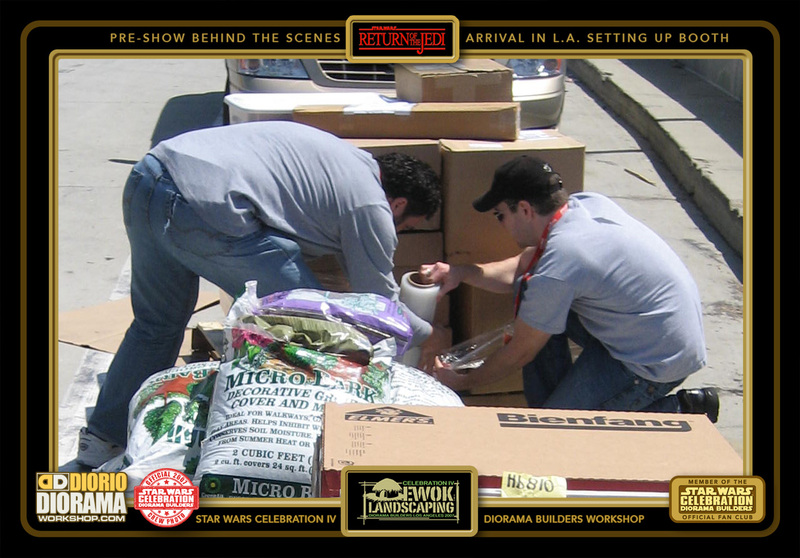 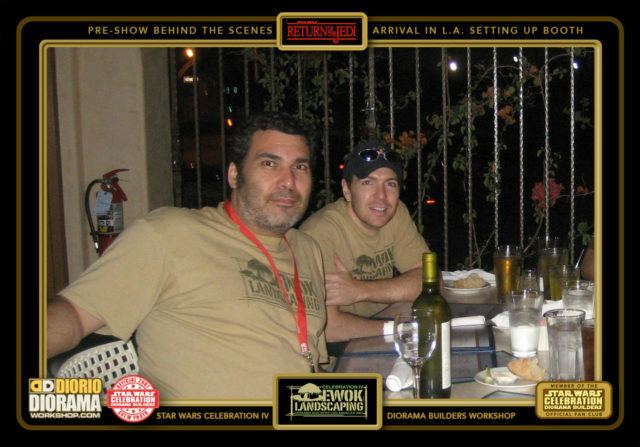 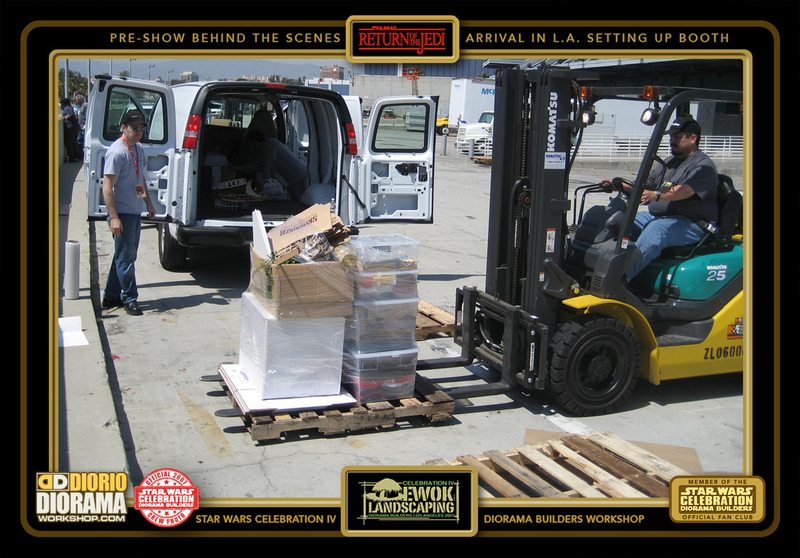 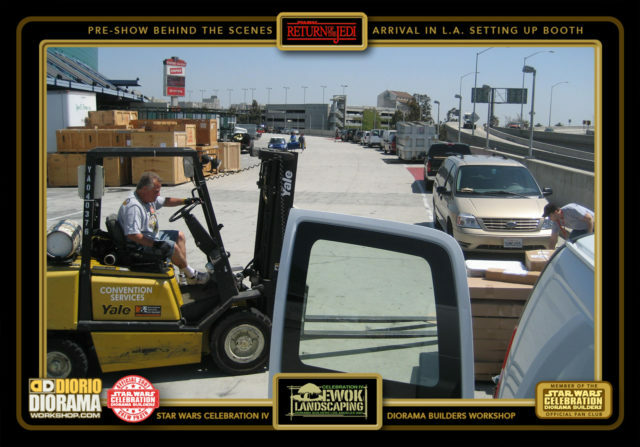 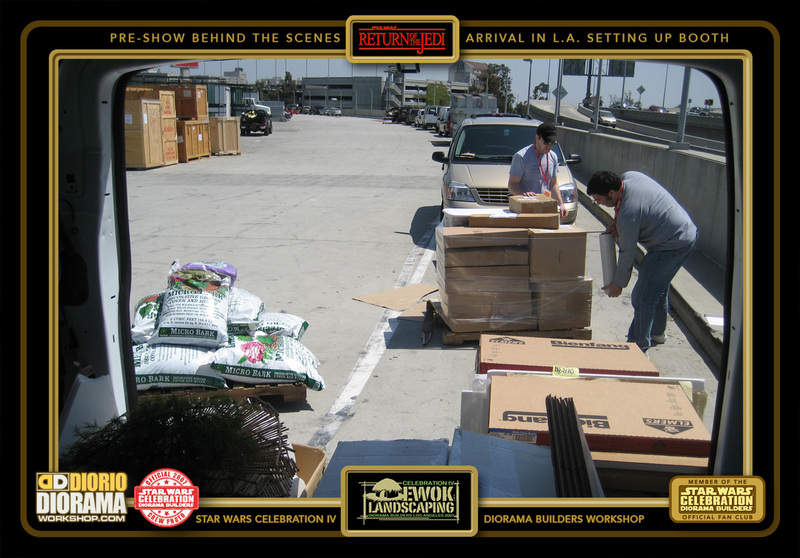 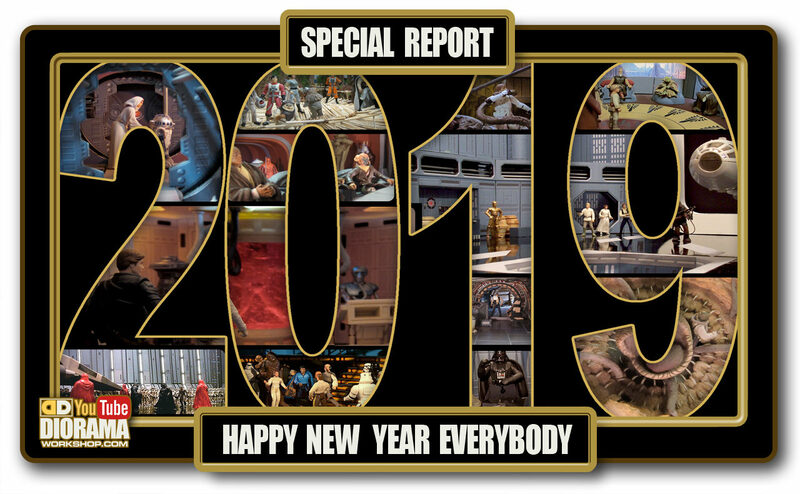 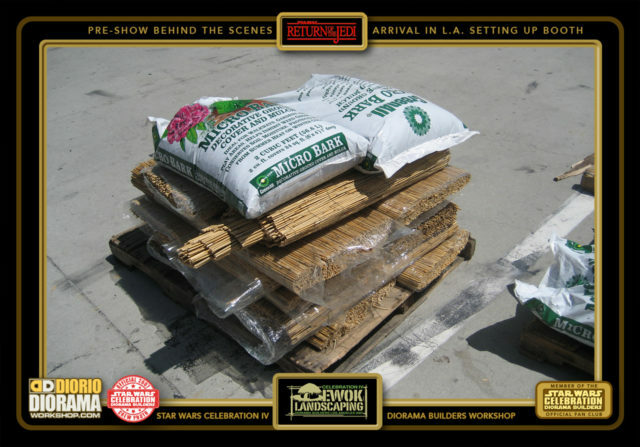 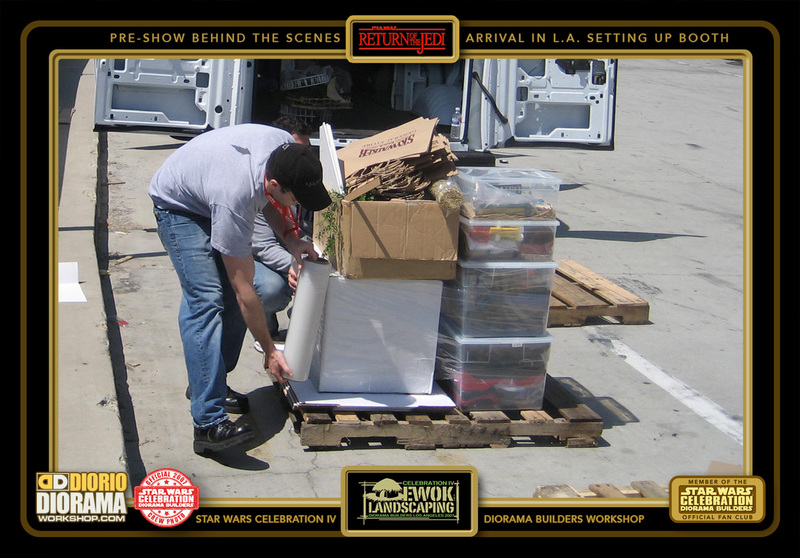 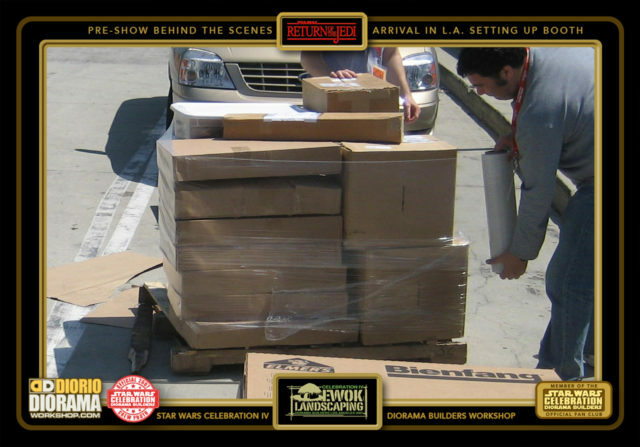 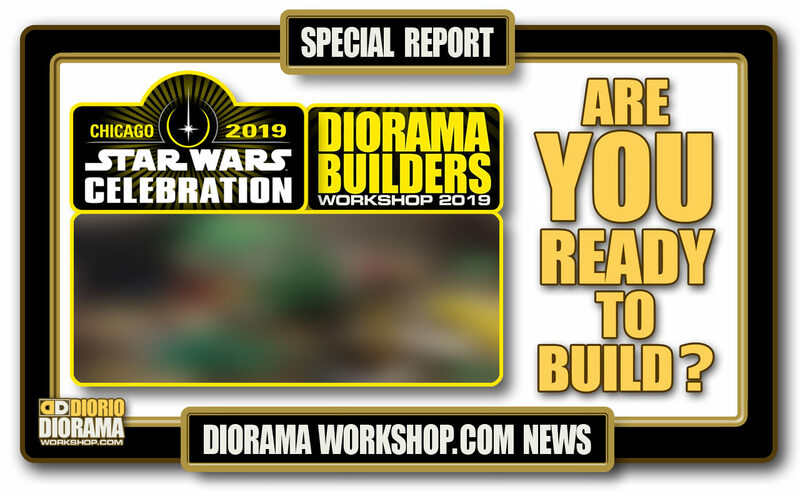 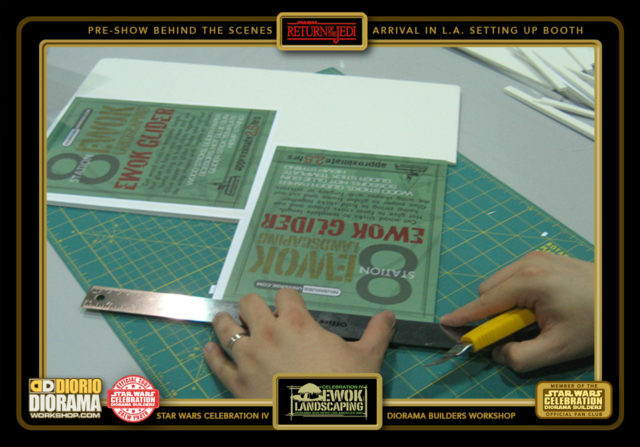 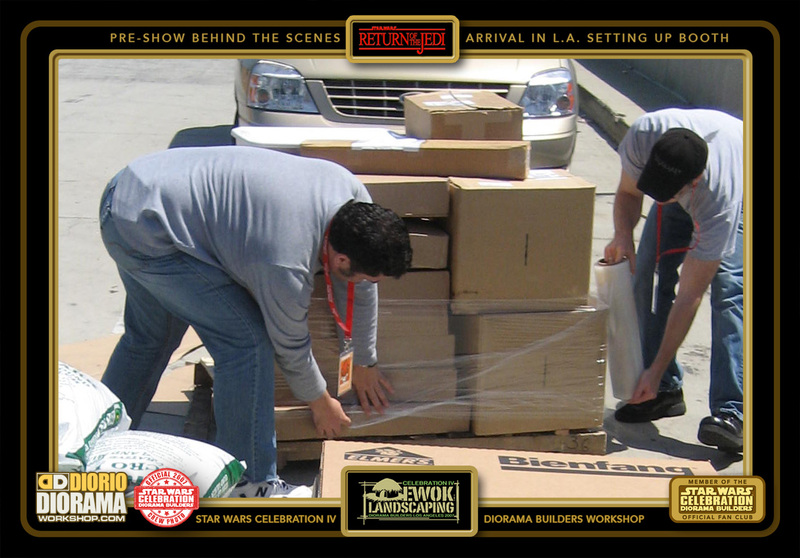 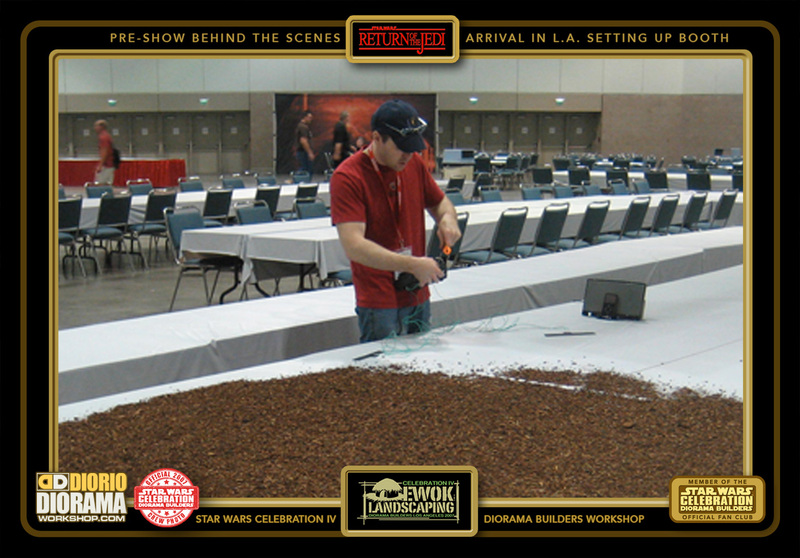 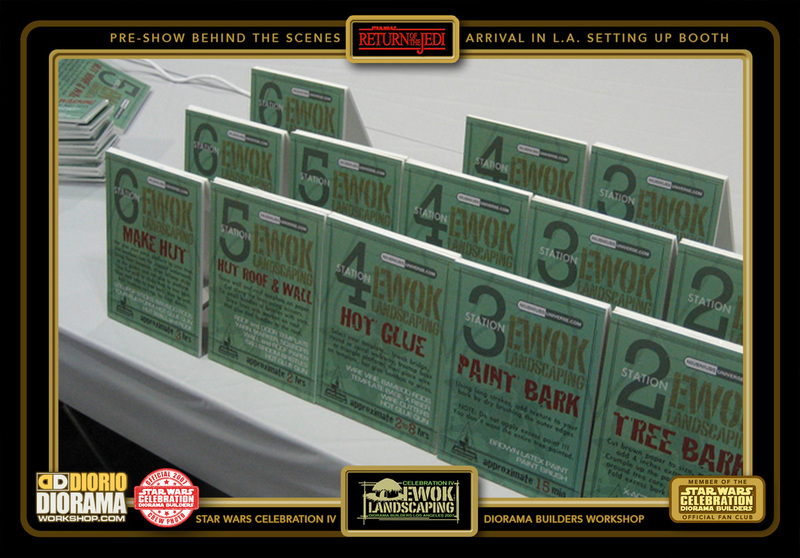 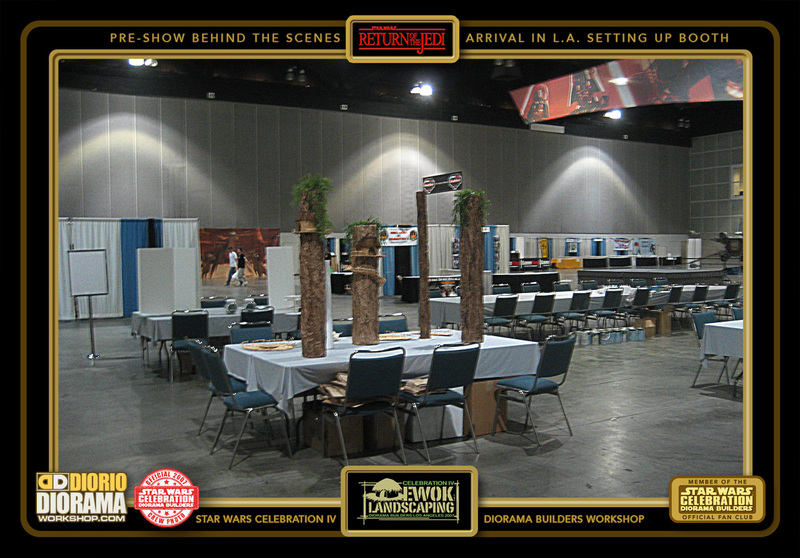 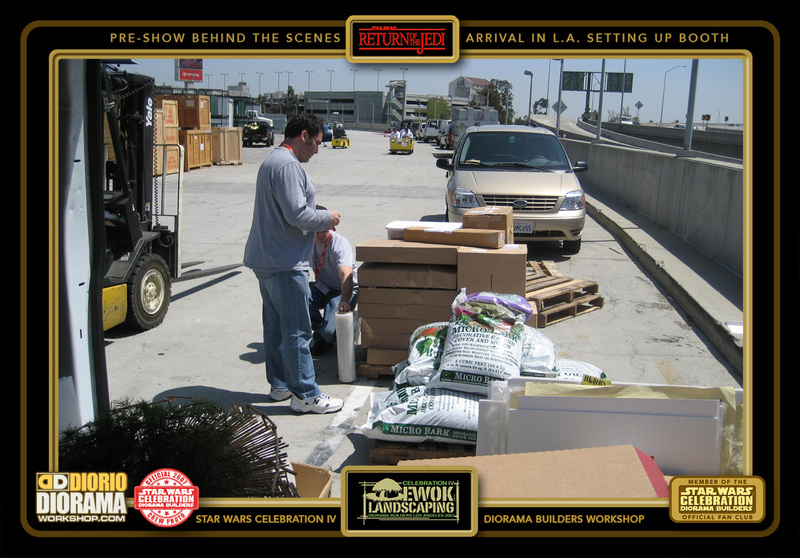 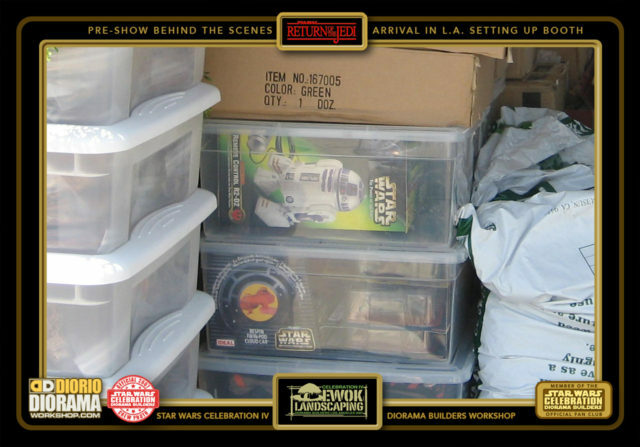 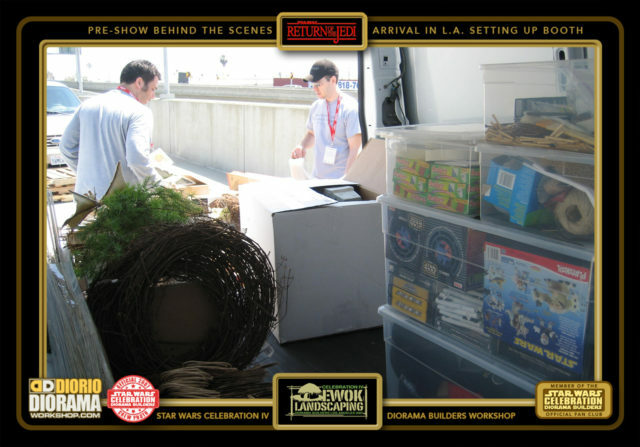 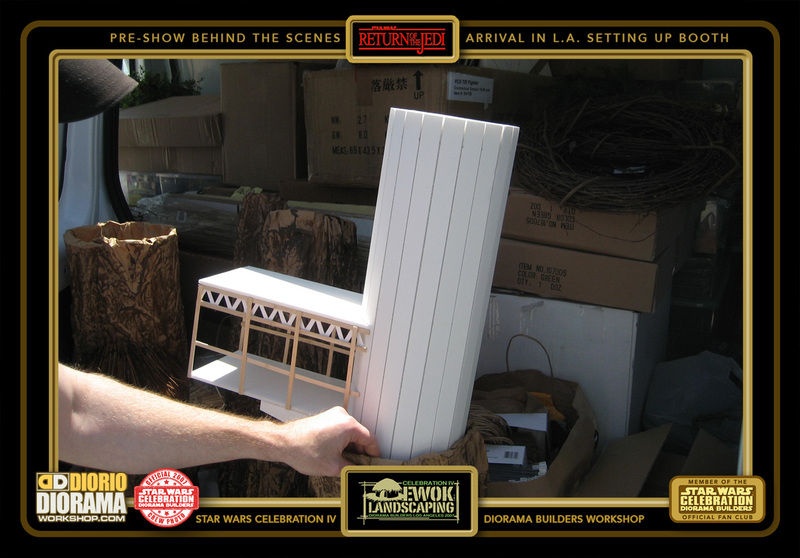 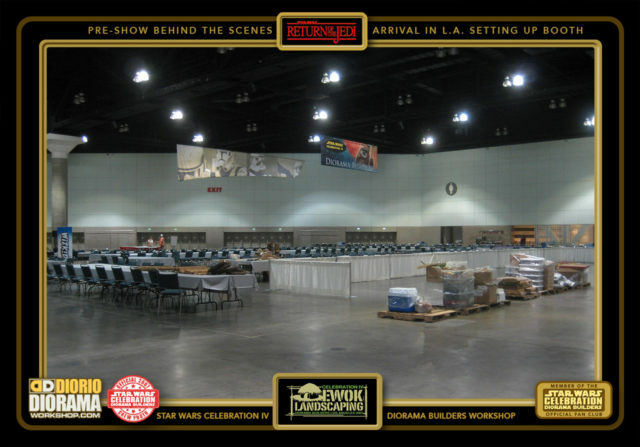 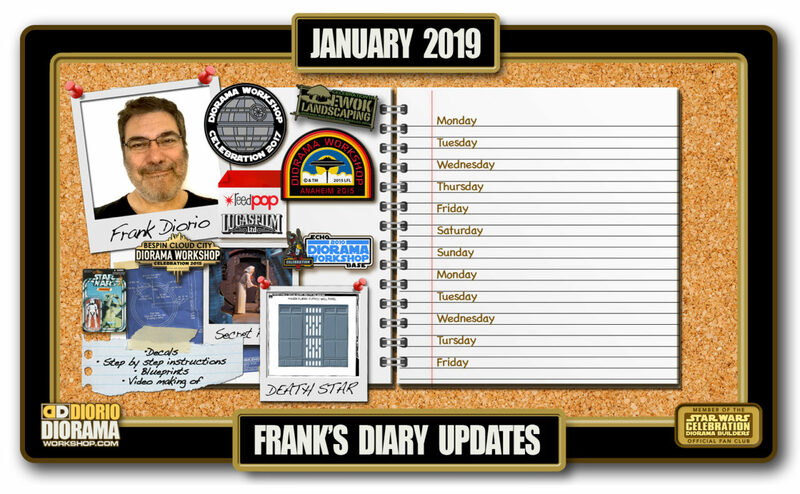 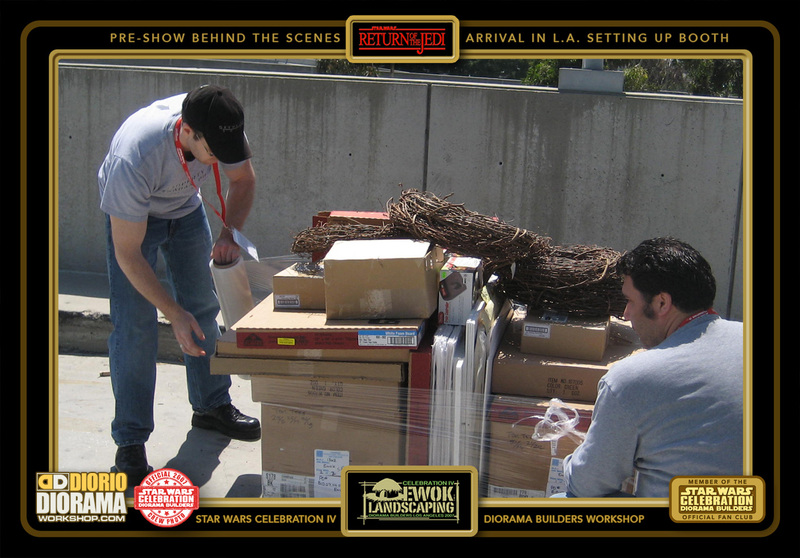 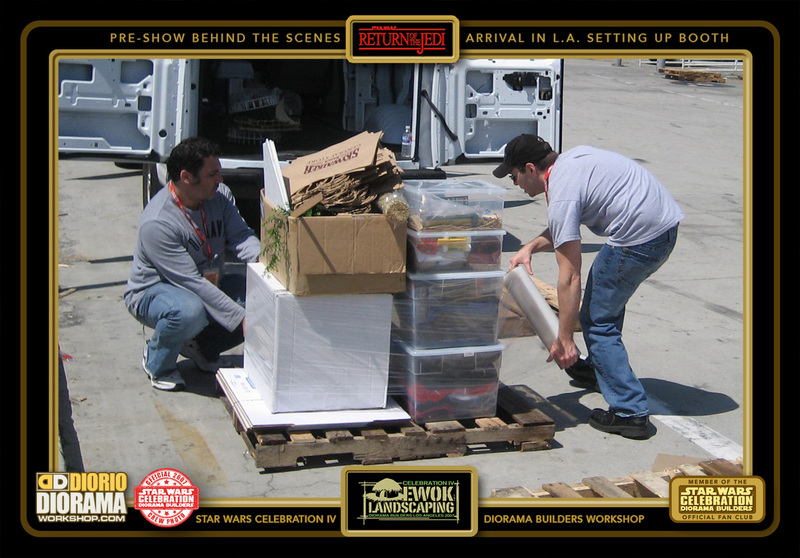 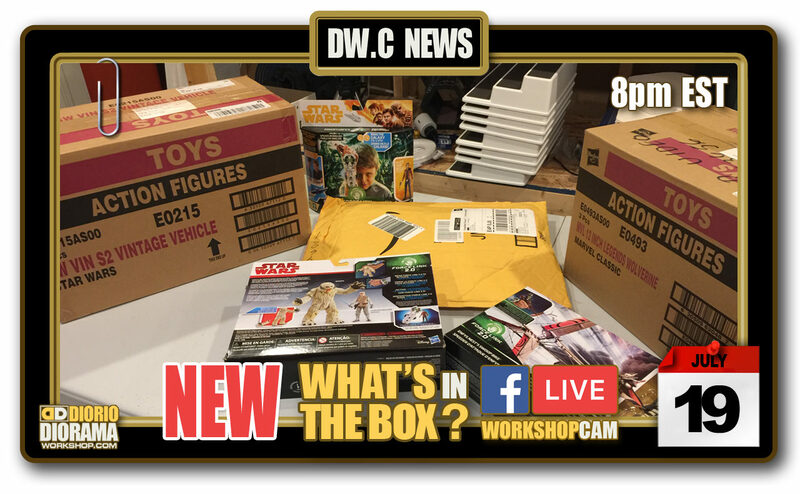 Welcome to the OFFICIAL Star Wars Celebration IV Ewok Landscaping Diorama Builders workshop site featuring my EXCLUSIVE CREW COVERAGE not seen anywhere else on the web. FRANK: The day before the show, always chaotic. 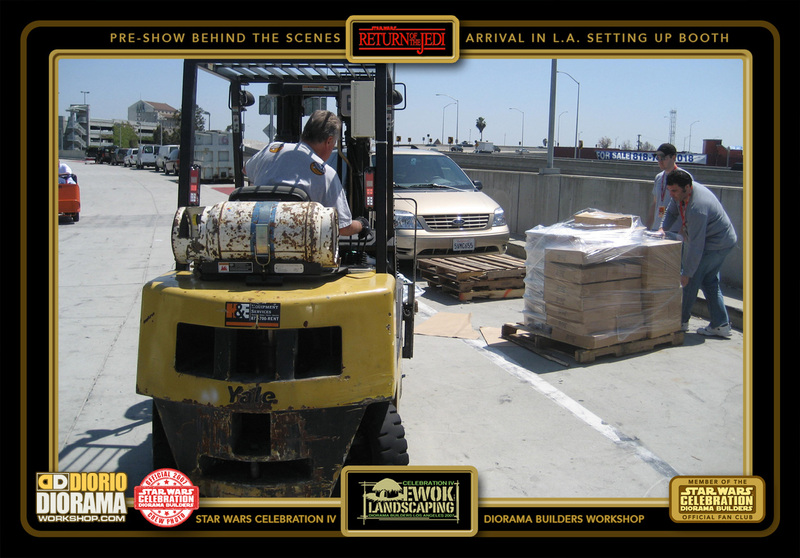 I had just finished my LAST SHOT on Transformers and said goodbye to my ILM team before meeting John at Lucasarts and heading to pick up the rental van. Plan to pack it and leave by 6 went downhill pretty fast LOL Van wasn’t ready blah blah blah, We ended leaving around midnight or 1 am. Drove ALL NIGHT, and I swear saw a UFO, that story is for another time 🙂 We arrived just before noon, and the Union prevented us from bringing our stuff in on a dolly like past conventions. 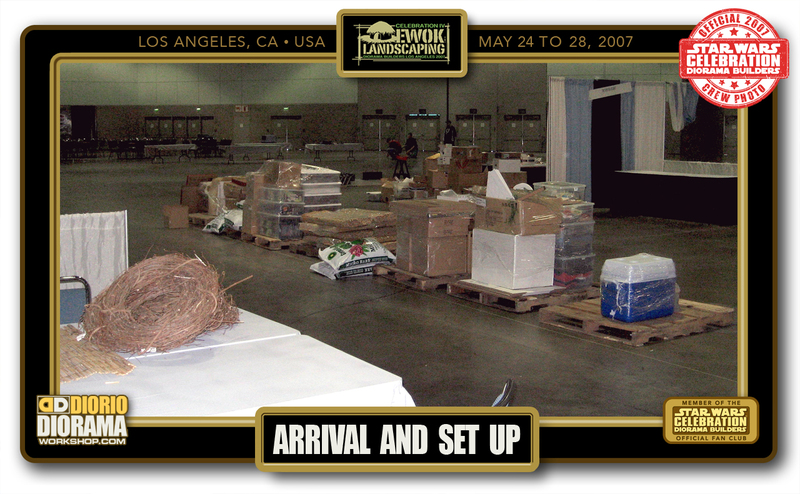 PLUS – We had fire marshal NOT wanting us to bring the Mulch into the convention center because it could catch fire. NOOO, there goes my design. Well that got solved thank god, and we spent 2 hours in hot sun wrapping plastic around boxes. Finally we could go inside. 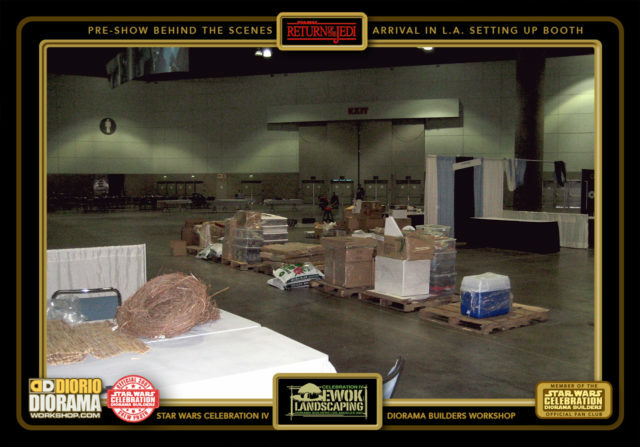 WOW look at the space they gave us this year. 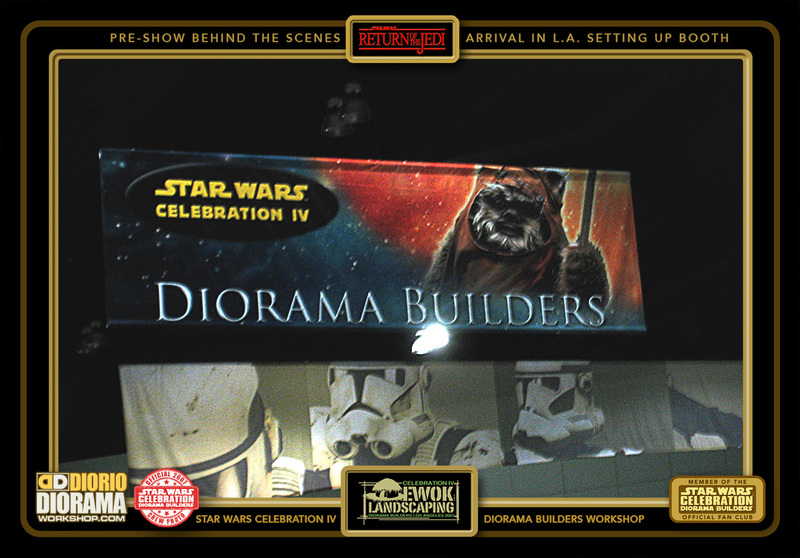 it was HUGE, and David convinced Mary it was time to give me a real sign and I got all teary eyed when I saw the GIANT EWOK BANNER. 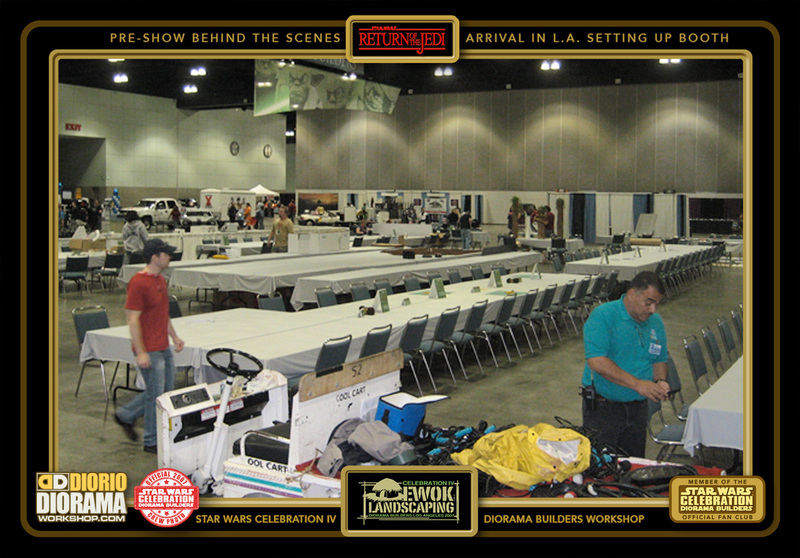 As a Star Wars fan to see that is already very cool, but to know it was done to thank me for all the hours spent planning and designing this Diorama Builders workshop that fans will be enjoying during the convention is something else 🙂 Electricity took a while to get here but all went pretty smooth today. 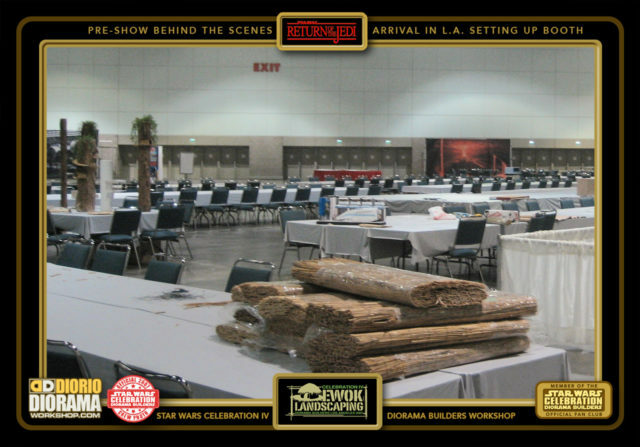 Mark was a huge help with the signage and Duke and Danielle helped finish the table layouts and making sure all was ready for the fans in the morning. The day ended with one of the BEST dinners (not the food – but the company and laughs we had) I have experienced in 15+ years.